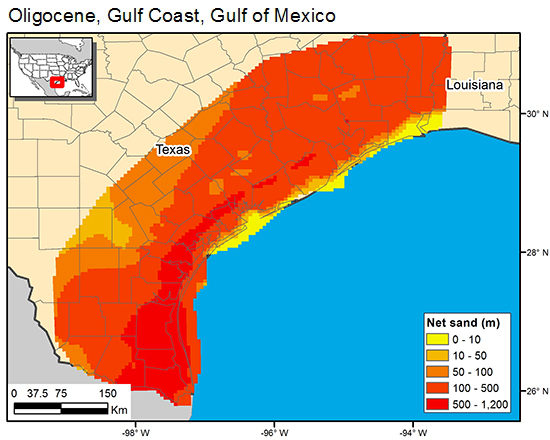 Net sand was digitized from three stratigraphic intervals (upper, middle, and lower) as defined by Galloway and others (1982), gridded in coarse 5-km cells (c4frio), and the three layers summed to produce gridded cumulative net sand. Galloway, W. H., Hobday, D. K., and Magara, Kinji, 1982, Frio Formation of the Texas Gulf Coast Basin—depositional systems, structural framework, hydrocarbon origin, migration, distribution, and exploration potential: The University of Texas at Austin, Bureau of Economic Geology Report of Investigations No. 122, 78 p.